North Korea on Thursday threatened to fire four missiles around Guam in a detailed outline of attack on US territory as an escalating war of words fans fears over an armed clash. Kim Rak-gyom, commander of the North’s Strategic Forces, said the military is “seriously considering a plan of enveloping fire” involving a simultaneous launch of four Hwasong-12 intermediate-range ballistic missiles toward Guam, the official Korean Central News Agency said. The plan is to “interdict the enemy forces on major military bases on Guam and signal a crucial warning” to Washington, he said. Once lifted off, the missiles would fly 3,356.7 kilometers for 1,065 seconds via the skies over the Shimane, Hiroshima and Koichi prefectures of Japan before landing in waters 30-40 kilometers away from the western Pacific island. “The Strategic Forces would finalize the enveloping fire plan by mid-August and report to comrade Kim Jong-un, commander-in-chief of the republic’s nuclear power, and await an order on standby posture for a strike,” the commander was quoted as saying. Unleashing another fiery round of rhetoric, Trump tweeted Wednesday that the US’ nuclear arsenal is “far stronger and more powerful than ever before.” “Hopefully we will never have to use this power, but there will never be a time that we are not the most powerful nation in the world!” he wrote. Adding to Trump’s remarks, US Defense Secretary Jim Mattis warned Wednesday that Pyongyang must “stand down” in its pursuit of nuclear weapons and refrain from any actions that would result in the demise of its regime. 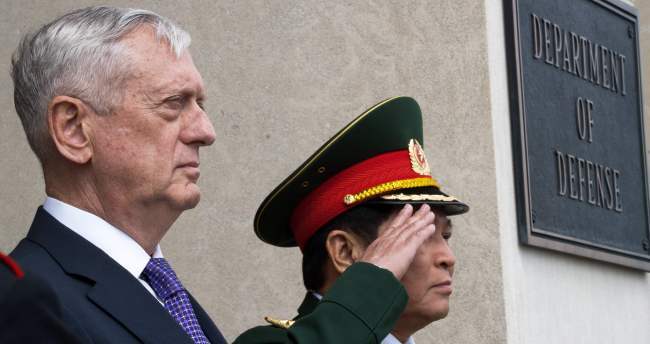 “The DPRK should cease any consideration of actions that would lead to the end of its regime and the destruction of its people,” Mattis said in a statement, using the acronym of the North’s official name, the Democratic People’s Republic of Korea. Tension has been flaring up as Pyongyang relays heated rhetoric over the new UN Security Council resolution adopted in response to its two tests of intercontinental ballistic missiles last month. Speculation has been growing that the regime may stage another major provocation to coincide with the Ulchi Freedom Guardian, the South Korea-US joint military exercises to kick off later this month. Guam is home to key US air and naval bases, from which it regularly dispatches strategic assets such as nuclear bombers and nuclear-powered submarines to the peninsula for regular drills or shows of force. 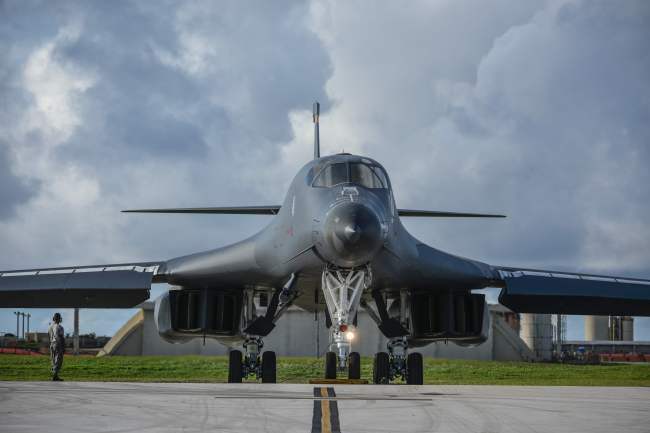 The Pentagon has prepared a plan to launch a pre-emptive strike on the North’s missile sites upon a presidential order, to which a B-1B bomber attack from Guam is key, NBC reported Wednesday, citing two senior military officials. “Donald Trump has been unequivocal: he will use any appropriate measures to protect the United States and her citizens,” Sebastian Gorka, a deputy assistant to Trump, told BBC radio Thursday. The intensifying war of words placed Seoul on the alert, prompting the Moon Jae-in administration to assess the situation and countermeasures during a meeting of the National Security Council on Thursday. The NSC urged the North to cease activities that increase tension, saying an armed clash would not be helpful to any country. “The NSC will explore all measures necessary to defuse tension and manage peace in cooperation with the US and other major partners, based on the joint defense posture with the US,” presidential press secretary Park Soo-hyun told reporters. “It’s true that the situation is a bit chaotic but I wouldn’t see it as a crisis. If we manage it well, it would rather allow us to turn this into an opportunity,” the official told reporters on customary condition of anonymity. 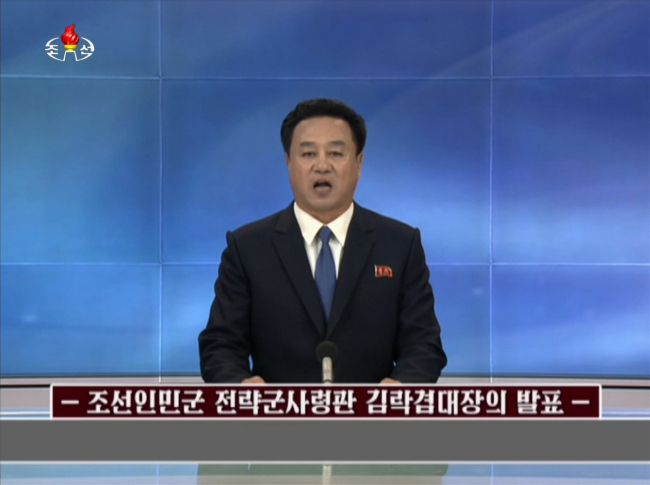 Foreign Ministry spokesperson Cho June-hyuck sought to dismiss the possibility of the US’ unilateral military action, saying the allies would closely consult ahead of taking any step or decision. Seoul’s Joint Chiefs of Staff also criticized Pyongyang, saying its ongoing series of inflammatory statements pose a critical challenge to the South Korean people and the alliance. “If the North commits a provocation despite our military’s stern warning, it will face strong and resolute retaliation from our military and the alliance,” the JCS said in a statement, adding the allies remain in full readiness for any attack. As tension spirals, China and Russia moved to step in, calling for both sides to refrain from aggravating the situation. Beijing’s official Global Times cautioned Washington to avoid floating military options, saying such a move makes Pyongyang’s threats “not only verbal” as shown in its accelerating nuclear and missile progress. 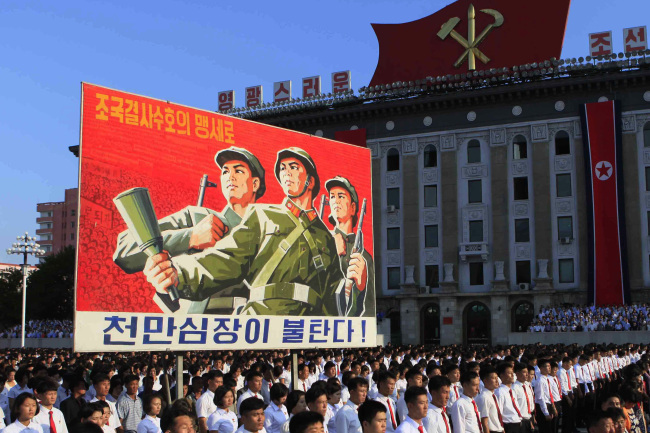 “The US can’t usually gain the upper hand in this war of words, as Pyongyang chooses whatever wording it likes, and what Washington says may not be heard by North Korean society,” the paper said in an editorial late Wednesday.